"Cheers to all who have been part of this journey, cheers to the past for the incredible memories and a huge cheers to the uncertain of what's next." The five-time Pro Bowler announced his decision after winning his third Super Bowl ring. New England Patriots tight end Rob Gronkowski has announced his retirement. The Super Bowl champion did so in a post on Instagram Sunday night just before 6 p.m.
"It all started at 20 years old on stage at the NFL draft when my dream came true, and now here I am about to turn 30 in a few months with a decision I feel is the biggest of my life so far," he said in the post. The tight end suffered a number of injuries throughout his career and underwent at least six surgeries. In the 2018 season, he missed three games due to back and ankle injuries and was diagnosed with a concussion on Jan. 21. Gronkowski ends his career with three Super Bowl rings and 79 career touchdowns. He was selected to the NFL Pro Bowl five times, named to the AP All Pro team four times and won the 2014 Comeback Player of the Year. He leads all NFL tight ends with career average of 68.4 receiving yards per game. He played in 16 playoff games throughout his career, amassing 81 receptions, 1,163 yards and 12 touchdowns. Driver Deliberately Drove Into 8 Pedestrians in Sunnyvale, Calif.
"I look forward to honoring him in the near future as both a Patriots and Pro Football Hall of Famer," Patriots owner Robert Kraft said in a statement. “As great of a player as he was, he is an even better person and ambassador of the game. Throughout his career, he made countless appearances in the community and there was no better remedy for hospital patients than a visit from Gronk." The last catch of his career was a 29-yard reception from quarterback Tom Brady in Super Bowl LIII against the Los Angeles Rams. That set up Sony Michel's game winning touchdown run. Gronkowski fought off double-coverage to haul it in. It was the last of six catches in the game. "From his rookie year until his final season and through countless times in between, Rob was a major reason why we won games and championships," head coach Bill Belichick said in a statement. New England Patriots tight end Rob Gronkowski, also known as “Gronk,” has been a fan favorite for years. But here are a few things you may not know about the football star. "Rob will leave an indelible mark on the Patriots organization and the game as among the best, most complete players at his position to ever play." Thanks to his injury history, rumors surrounding Gronkowski's potential retirement were abundant. 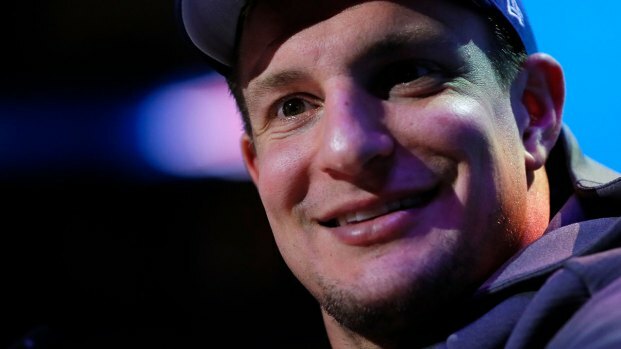 After the Patriots loss to the Philadelphia Eagles in Super Bowl LII, Gronkowski was asked by reporters if he was going to call it quits. “I don’t know how you heard about that,” he responded. Gronkowski spent his entire career with New England. He was drafted 42nd overall in 2010 after two years at the University of Arizona in which he scored 16 touchdowns. Brady thanked his tight end with his own post on Instagram. "The NFL was a better place with you in it," he said. "But I have no doubt you will be a success in anything you do."